Just got up and walked outside to really see the patio now that it's dry. It is beautiful. Michael and I are so pleased, and I know Mom will enjoy being able to walk down to the rosebed this spring and summer. Thank you for using your skill and imagination to create such a wonderful outdoor area for us. I know this winter has been hard to schedule, but it is sure worth the wait! "Bobby's Concrete quoted to me a price for a concrete slab for my outdoor shed at my home. The price seemed fair and Dean was able to schedule the work within my time frame. His crew got in and out quickly, did an excellent job and left a clean work site. I can easily recommend this firm to not only do good work but to trust them around your home." 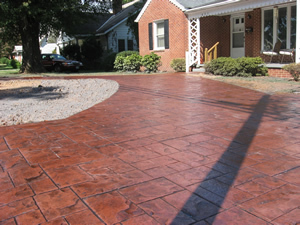 "Bobby’s Concrete did a slab for a garage, a patio and a driveway for us. Their work looks great! They did a great job for us. We will use them for any concrete work we need in the future and would highly recommend their services. They are a great company!" "I have used Bobby's concrete since I started building in 1998. I chose Bobby's because of their reputation for quality and good service after the sell." "Work was performed on time as scheduled, clean up was great, and job was billed as quoted. No surprises, just a job well done! I’d definitely use Bobby’s Concrete again." "Our driveway was a complete mess - the entire center section was crumbling and constantly shedding rock. Plus we really needed a wider drive, so my husband and I could stop the playing 'switch the cars out' game each evening. Dean came up with a great solution - replacing the driveway from the middle section down to the street AND widening the lower section so we could park two cars next to each other. Our new driveway is fabulous! Its looks wonderful, the contour line of the widened area follows the same lines as the adjoining english ivy. The work was done quickly and everything was cleaned up when I got home from work. I couldn't be happier with the work Bobby's Concrete did for us." To see more photos of this driveway project, go to our Concrete Repair page.